Annotation. In the contemporary restaurant business specific attention is paid to the choice of cooking direction. The centuries-old traditions, culture and likes of Ukrainians caused a large percentage of flour products consumption. The most popular among consumers are pancakes, which amino acid contents is not enough balanced, therefore food industry pays much attention to quality improvement and pancakes enrichment with high proteins adding lupine flour to the products. The authors of the article are deeply studying and discovering this issue. The analyses of the domestic and world experience in fortification of nutritional and biological value of flour products by means of using of non-traditional herbal high-protein raw materials, exactly lupine flour, has been presented in the paper. As far as nowadays at the food products market the seeds of different lupine sorts are widely represented, but also the products of its transformation, as flour, powder and even concentrate. The perspective of using of lupine flour in technology of flour products and meals was shown. It was proven that lupine flour belongs to unique sources of nutrients as proteins and mineral substances. Usage of lupine flour in the technology of pancakes cooking allows to increase the protein and fat contents in the ready-made products and to decrease the number of carbohydrates at the same time. For the lupine flour one of the characteristic feature is the qualitatively better amino acid contents of proteins, namely unchanged amino acids. The optimal amount of lupine flour in the in technology of pancakes without worsening of the quality was determined. It was approved in addition to all-above mentioned that lupine seeds are perspective high protein row materials for flour products and that pancakes of the better quality can be made with adding 25% of lupine flour to dough as well. In conclusion the object of study was distinguished, the given aim was achieved, the materials were fully and deeply elaborated, the necessary conclusions were made. Keywords: pancakes, lupine, protein, lupine flour, quality of products. G. M. Hospodarenko, S. P. Poltoretskyi, V. V. Liubych, V. V. Novikov, V. V. Zheliezna, N. V. Vorobyova, I. F. Ulianych. Quality formation of pasta and confectionery products from grain of wheat spelta. The results of quality formation of spelt wheat macaroni and confectionery products are presented. It is found that the content of carotenoid pigments in the grain of Zoria Ukrainy wheat variety was 0,16–0,39 mg/ kg. Consequently, the content of yellow pigments in grain of spelt wheat varieties and strains is insufficient to produce macaroni with a yellow color, so egg melange should be added into the recipe. Culinary evaluation of macaroni made from spelt semolina is carried out according to indicators of grain cooking, color and dry weight loss. Grain cooking coefficient of NAK34/12–2 introgressive strain was the highest and was 9 points. Grain cooking coefficient of other varieties and strains varied from 5 to 7 points. The overall evaluations of macaroni made from semolina of LPP 3122/2, P 3, LPP 3373, NAK 22/12 and NAK34/12–2 strains were significantly higher than the check variant value and were 6,0–7,0 points or 67–78 % of the maximum value. This indicator of Schwabenkorn variety and LPP1197 strain was significantly lower of 5,0 points and this indicator of other forms was at the check variant level (5,5 points). Cake-type bun expandability made from spelt wheat flour of Zoria Ukrainy (st) is 269 cm3. This figure of other varieties and strains was within 249–274 cm3. The specific volume of the cake-type bun of Zoria Ukrainy and Schwabenkorn varieties, LPP 1224, NAK 22/12 and TV 1100 strains was the highest and was 2,59–2,63 cm3/g. It was smaller of other samples and varied from 2,39 to 2,50 cm3/g. Sponge cake expandability made from spelt wheat flour of varieties and strains was 368–395 cm3.The specific volume of the sponge cake made from spelt wheat flour of varieties and strains varied from 2,88 to 3,09 cm3/g. Keywords: spelt wheat, quality, semolina, macaroni, cake-type, sponge cake. Hospodarenko H. M. Khlibopekarski vlastyvosti zerna spelty zalezhno vid vuhlevodno-amilaznoho kompleksu // Zb. nauk. pr. Ahrobiolohiia / Hospodarenko H. M., Liubych V. V., Polianetska I. O., Voziian V. V. – Bila Tserkva. – 2015. – № 2 (121). – S. 57–61. Liubych V. V. Formuvannia vmistu bilka v zerni sortiv i linii pshenytsi spelty // Henomika ta biokhimiia silskohospodarskykh roslyn: materialy Mizhn. nauk. konf. – Odesa. – 2017. – S. 92–94. Metodyka derzhavnoi naukovo-tekhnichnoi ekspertyzy sortiv roslyn. Metody vyznachennia pokaznykiv yakosti produktsii roslynnytstva. Za red. S. O. Tkachyk. – Vinnytsia: Nilan-LTD, – 2015. – 160 s.
Nechaev A. P. y dr. Fyzyolohychesky funktsyonalnyie ynhredyentyi pry proyzvodstve tradytsyonnyikh produktov pytanyia – khlebobulochnyikh yzdelyi. Pyshchevyie ynhredyentyi. Syire y dobavky. – 2011. – № 1. – S. 44–46. Podpriatov H. I., Yashchuk N. O. Prydatnist zerna pshenytsi spelty ozymoi dlia khlibopekarskykh ta kormovykh tsilei. Novitni ahrotekhnolohii. – 2013. – № 1(1). – S. 71–79. Problema mikroelementiv u kharchuvanni naselennia Ukrainy ta shliakhy yii vyrishennia [Elektronnyi resurs] / V. N. Korzun, I. P. Koziaryn, A. M. Parats [ta in.]. Problemy kharchuvannia. – 2007. – № 1. – S. 5–11. Sposib laboratornoho vyhotovlennia ta otsinky keksu z boroshna trytykale i pshenytsi: pat. 118060 Ukraina, MPK A 21D 8/02 / Liubych V. V.; zaiavnyk i vlasnyk UNUS. – № u 2016 13216; zaiavl. 23.12.2016., chynnyi z 25.07.2017, Biul. № 14. Sposib laboratornoho vyhotovlennia biskvita z boroshna trytykale i pshenytsi ta yoho otsinka: pat. 118362 Ukraina, MPK A 21D 8/00 / Liubych V. V.; zaiavnyk i vlasnyk UNUS. – № u 2016 13202; zaiavl. 23.12.2016., chynnyi z 10.08.2017, Biul. № 15. Marconi E., Carcea M., Schiavone M. et al. Spelt (Triticum spelta L.) pasta quality: Combined effect of flour properties and drying conditions. Cereal Chem. – 2002. – № 79. – P. 634–639. Rozenberg R., Ruibal-Mendieta N. L., Petitjean G. et al. Phytosterol analysis and characteri-sation in spelt (Triticum aestivum ssp.spelta L.) and wheat (T. aestivum L.) lipids by LC/APCI-MS. J. Cereal Sci. 2003. № 38. P. 189–197. Ruibal-Mendieta N. L., Delacroix D. L., Meurens M. A comparative analysis of free, bound and total lipid content on spelt and winter wheat wholemeal. J. Cereal Sci. 2002. № 35. P. 337–342. Skrabanja V., Kovac B., Golob T. et al. Effect of spelt wheat flour and kernel on bread composition and nutritional characteristics. Journal of agricultural and food chemistry. 2001. V.49. № 1. P. 497–500. The calculating problems of the overhead transmission lines span are analyzed. The design tasks of overhead transmission lines are given, in which the spanlength plays an important role. This indicates that the spanlength is the main parameter of overhead transmission lines. The purpose of the article is to determine approximately the span length by means of continuous functions. Calculation of the spanlength is performed based on the use of mechanical loads of conductors. The loads of the conductor weight, of the ice weight and of the wind pressure are considered. The spanlength is calculated in the presence of the most adverse climatic conditions, when all kinds of mechanical loads on the conductors are present. The tension of the conductors is also taken into account to ensure the permissible value of the conductor sag. The discrete coefficients of the mechanical loads of the conductors are approximated by means of continuous functions, which make it possible to considerably simplify the calculation of the span length and to apply the proposed method in the algorithms of computer-aided design of overhead transmission systems. The error of the applied functions of the approximation of the mechanical load coefficients tends to zero due to the selected functional dependencies. The final value of the span length is determined from two inequalities that limit the span length according to the conditions of the maximum permissible sag and the maximum mechanical load in the conductor under adverse climatic conditions. The first of the conditions has a simple mathematical form, so it can be solved analytically. The second condition is described by a complex mathematical relationship, which can be solved graphically or analytically using numerical procedures. As a normative basis for the algorithm development, the electrical installation code of Russia and Ukraine were used. Conclusion: The proposed calculation algorithm makes it possible to determine approximately the span length of overhead lines by using a simplified procedure without the application of additional reference data; at the same time the approximating functions used have almost no errors, which allowingto predicate the high level of accuracy of the proposed algorithm. Keywords: overhead transmission line, span, sag, approximation, continuous function. Kimstach O.Iu. Metod porivnialnykh otsinok dlia vyboru optymalnoi struktury elektroenerhetychnoi systemy / O.Iu. Kimstach, V.Ie. Yermolenko // Sciences of Europe. – Praha, – 2018. – Vol 1, № 23. – S. 63-69. Shkliarchuk F.N. Nelyneinyie kolebanyia y halopyrovanye provoda s obledenenyem / F.N. Shkliarchuk, A.N. Danylyn // Yzvestyia TulHU. Tekhnycheskye nauky. – 2013. – Vyip. 11 – S. 188-197. Wydra M. Overhead Transmission Line Sag Estimation Using a Simple Optomechanical System with Chirped Fiber Bragg Gratings. Part 1: Preliminary Measurements / M. Wydra, P. Kisala, D. Harasim, P. Kacejko // Sensors. – 2018, – № 18 (1), 309. Pavlinić A. Direct monitoring methods of overhead line conductor temperature / A. Pavlinić, V. Komen // Engineering Review, – 2017. – Vol. 37, Issue 2, – pp. 134-146. Oluwajobi F. I. Effect of Sag on Transmission Line / F.I. Oluwajobi, O.S. Ale, A. Ariyanninuola // Journal of Emerging Trends in Engineering and Applied Sciences (JETEAS). – 2012. – № 3 (4), – rr. 627-630. Pravyla ustroistva elektroustanovok / M-vo enerh. Ros. Federatsyy. – 7-e yzd. – M.: ENAS, 2004. Pravyla ulashtuvannia elektroustanovok / Minenerhovuhillia Ukrainy – 5-te vyd., pererobl. y dopovn. – 2014. Sveshnykova E.Iu. Tekhnycheskoe sopostavlenye razlychnyikh konstruktsyi vozdushnyikh lynyi elektroperedach / E.Iu. Sveshnykova, S.V. Makoldyn // Sovremennaia nauka: aktualnyie problemyi y puty ykh reshenyia. Lypetsk: Maksymal ynformatsyonnyie tekhnolohyy, 2016. – № 6 (28). – S. 5-6. Vasiura Yu.F. Uslovye эkonomycheskoi tselesoobraznosty sooruzhenyia lynyi эlektroperedachy s prymenenyem provodov s uluchshennyimy kharakterystykamy / Yu.F. Vasiura, M.A. Hlazyiryn, T.A. Pleshkova // Alleia nauky. – 2017. – T. 2. № 15. – S. 647-650. Karasev N.A. K voprosu o prymenenyy kompaktnyikh VLZ 35 kV / N.A. Karasev // Zhurnal ЭLEKTRO – 2008. – № 4 – S. 39-40. Horokhov Ye. V. Analiz prychyn i naslidkiv avarii na diliankakh PL 330 kV Dzhankoiskykh MEM krymskoi elektroenerhetychnoi systemy NEK «Ukrenerho» / Ye. V. Horokhov, S. M. Bakaiev, Ya. V. Nazim, V. V. Morhai, M. S. Popov // Metalevi konstruktsii. – Makeevka, 2010. – Tom 16, № 2. – S. 75-92. Belytsyin Y.V. Modely vneshnykh vozdeistvyi na эlektromahnytnoe pole vozdushnoi lynyy эlektroperedach dlia analytyko-ymytatsyonnoho modelyrovanyia / Y.V. Belytsyin // Polzunovskyi vestnyk. – 2011. – №2 / 2 – S. 49-55. In breeding work with breeds, herds play a significant role in families that are characterized by high tribal value by a set of features. In a work with a herd of the Ukrainian Red Dairy Breed, it is expedient to analyze milk production of cows of high-yielding families. The highest levels of dairy productivity were found in the families of Tsarivna 968, Malyna 22, Purga 5842, Pilotka 4838 and Bistra 1988, whose milk production during all lactation ranged from 4473 to 4727 kg of milk. One of the important indicator of productivity is the fat content in milk. The following families were the most fatty ones like Purga 5842, Pilotka 4838, Malyna 22, Luna 610, Voloshka 1496, Liana 02900 and Rozetka 2888. They had the advantage for fat content in milk compared to the Travka 7858family. The duration of the inter-birth period is an important indicator of the reproductive capacity of cows. The extended inter-birth period for families Pilotka 4838, Bistra 1988 and Malyna 22 was 388,1-411,5 days. They had a definite advantage over the Kukla family 226 and the difference was, according to family names, 46,5 days (P > 0,99); 53,6 days (P > 0,95) and 69,9 days (P > 0,99). A low coefficient of reproduction is observed in cows of different families during the long inter-birth period. Its optimal number belongs to for the families Tsarivna 968, Zmiyka 266, Liana 02900 and Kukla 226.Their reproductive ability ratesfrom 1,02 to 1,07. The difference in comparison to Malyna 22family is 0,10 (P > 0,95); 0,14 (P > 0,95); 0,14 (P > 0,99) and 0,15 (P > 0,999) accordingly to names. It should be noted that the majority of the studied high-yielding familiesof Ukrainian Red Dairy Breeds are characterized by optimal values of reproductive capacity, and only three families Malyna 22, Pilotka 4838 and Bistra 1988 are characterized by a lower indicator of KVZ (0,92-0,94). Thus, the best families for milk production, which combine high milk yield and fat content in milk, are the families of Bistra 1988 and Pilotka 4838. Key words: breed, selection, family, ancestor, sign, milk productivity, reproductive ability. Bashchenko M. I. Rol koriv-rekordystok ta rodyn u selektsii molochnoi khudoby / M. I. Bashchenko, A. M. Dubin. – K. : Fitosotsiotsentr, 2006. – 152 s.
Bashchenko M. I. Suchasni metody vedennia selektsiinoi roboty u molochnomu skotarstvi Cherkaskoho rehionu / M. I. Bashchenko, I. V. Tyshchenko // Rozvedennia i henetyka tvaryn : mizhvidom. tematych. nauk. zb. – Kyiv, 2005. – Vyp. 39. – S. 3–9. Basovskyi M. Z. Rozvedennia silskohospodarskykh tvaryn / M. Z. Basovskyi, V. P. Burkat, D. T. Vinnychuk [ta in.]. – Bila Tserkva : Bilotserkivskyi derzhavnyi ahrarnyi universytet, 2001. – 399 s.
Dubin A. M. Pleminne znachennia ta metody otsinky rodyn koriv / A. M. Dubin // Visnyk Bilotserkivskoho derzhavnoho ahrarnoho universytetu : zb. nauk. prats. – Bila Tserkva, 1999. – Vyp. 8. – Ch. 2. – S. 80-85. Oblyvantsov V. V. Selektsiini metody formuvannia ta otsinka vysokoproduktyvnykh rodyn sumskoho vnutriporodnoho typu ukrainskoi chorno-riaboi molochnoi porody / V. V. Oblyvantsov // Visnyk Sumskoho natsionalnoho ahrarnoho universytetu, naukovo-metodychnyi zhurnal : seriia «Tvarynnytstvo». – Sumy, 2015. – Vyp. 2 (27). – S. 63–66. Plokhynskyi N. A. Rukovodstvo po byometryy dlia zootekhnykov / N. A. Plokhynskyi. – M. : Kolos, 1969. – 255 s.
Polupan Yu. P. Formuvannia zavodskykh rodyn stvoriuvanoi chervonoi molochnoi porody / Yu. P. Polupan, T. P. Koval // Rozvedennia i henetyka tvaryn : mizhvidom. tematych. nauk. zb. – K. : Ahrarna nauka, 2000. – Vyp. 33. – S. 105–110. Selektsiia molochnoi khudoby i svynei : navch. posib. / T. V. Pidpala [ta in.] ; za red. profesora T. V. Pidpaloi. – Mykolaiv : MNAU, 2012. – 297 s.
Skliarenko Yu. I. Formuvannia zavodskykh rodyn ukrainskoi buroi molochnoi porody / Yu. I. Skliarenko, T. O. Cherniavska, L. V. Bondarchuk, I. P. Ivankova // Rozvedennia i henetyka tvaryn : mizhvidom. tematych. nauk. zb. – Kyiv, 2017. – Vyp. 54. – S. 106–111. The study of the genetic structure of experimental populations of different species of animals and birds is one of the most actual problems of modern agricultural biology. Microsatellites are referred to one of the most effective tools for studying the genetic variability of populations. The objective of the research is to determine the genetic differentiation of five subpopulations of Ukrainian dual-purpose chickens using microsatellite markers. The research was carried out on five subpopulations of Ukrainian dual-purpose chickens – G-1, G-2, G-3, G-4 and C. The following microsatellite markers were used for the research: MCW0081, MCW0034, MCW0104, ADL0268, LEI0166, ADL0278, LEI0094, and MCW0123. The avian feathers were used as a source of biological material. DNA from the test samples was isolated using a DNA-sorb-B commercial reagent kit (AmpliSens, Russia). The amplification was carried out using standard methods and appropriate reagents. Polymorphism for each of studied microsatellite loci in the experimental subpopulations of dual-purpose chickens of Ukrainian selection was identified. The total indicators of genetic variability in all experimental groups differed. The total allele pool in all experimental populations for 8 selected microsatellite loci was presented by 38 alleles. The lowest genetic diversity for the number of alleles per locus in all experimental populations was shown for ADL0278 marker (3 alleles per locus), the largest – for MCW0104 (6.4 alleles per locus). According to the analysis of Write’s F-statistics, most of the revealed genetic variability corresponded to the intra-population component (9.2% of the total genetic variability were distributed between subpopulations and 90.8% within subpopulations). It was revealed that G-1 and G-4 subpopulations were the most remote by the values of genetics distances (28.8% of differences), while G-2 and G-3 subpopulations were the closest (13.3% of differences). So, as results of the research, pronounced difference between subpopulations was revealed that corresponds to the average degree of divergence in experimental chicken groups. This reflects their common origin and the intensity of the breeding work being carried out. Key words: population, chickens, microsatellites, polymorphism, allele, genetic structure. Khlestkina E.K. Molecular markers in genetic studies and breeding / E.K. Khlestkina // Russ. J. Genetics. – 2014. – Vol. 4 (3). – P. 236–244. Microsatellite markers: what they mean and why they are so useful / M.L.C. Vieira, L. Santini, A.L. Diniz [et al.] // Genetic and molecular biology. – 2016. – Vol. 39 (3). – P. 312–328. Absence of population substructuring in Zimbabwe chicken ecotypes inferred using microsatellite analysis / F. Muchadeyi, H. Eding, C. Wollny [et al.] // Animal Genetics. – 2007. – Vol. 38, №4. – R. 332–339. Gholizadeh M. Use of microsatellite markers in poultry research / M. Gholizadeh, G.R. Mianji // International Journal of Poultry Science. – 2007. – Vol. 6 (2). – P. 145–153. Relationship between microsatellite marker alleles on chromosomes 1-5 originating arom the Rhode Island Red and Green-legged Partrigenous breeds and egg production and quality traits in F2 mapping population / B. Wardecka, R. Olszewski, K. Jaszczak [et al.] // J. Appl. Genet. – 2002. – Vol. 43 (3). – P. 319–329. Evolution of the polymorphism at molecular markers in QTL and non-QTL regions in selected chicken lines / V. Loywyck, B. Bedhom, M.H. Pinard-van der Laan [et al.] // Genet. Sel. Evol. – 2008. – Vol. 40. – P. 639–661. Microsatellite Markers Associated with Resistance to Mareks Disease in Commercial Layer Chickens / J.P. McElroy, J.C. Dekkers, J.E. Fulton [et al.] // Poultry Science. – 2005. – Vol. 84. – P. 1678–1688. Bumstead N. Genomic mapping of resistance to Mareks disease / N. Bumstead // Avian Pathology. – 1998. – Vol. 27. – P. S78–S81. Romanov M.N. Analysis of genetic relationships between various populations of domestic and jungle fowl using microsatellite markers / M.N. Romanov, S. Weigend // Poultry science. – 2001. – Vol. 80. – P. 1057–1063. Henotypuvannia kurei krosu “Loman bilyi” / A.V. Shelov, V.H. Spyrydonov, S.D. Melnychuk [ta in.] // Biolohiia tvaryn: naukovo-teoretychnyi zhurnal. – 2009. – Tom. 11, № 1. – S. 276–280. Vykorystannia mikrosatelitnykh markeriv DNK dlia kontroliu pokhodzhennia ta odnoridnosti populiatsii silskohospodarskoi ptytsi / A.V. Shelov, N.P. Ponomarenko, V.P. Borodai [y dr.] // Suchasne ptakhivnytstvo. – 2013. – № 2 (123). – S. 16–19. Monitorynh imunohenetychnoi struktury kurei riznykh porid / O.P. Podstrieshnyi, V.P. Khvostyk, I.O. Podstrieshna [ta in.] // Ptakhivnytstvo: mizhvid. temat. nauk. zb. – 2011. – Vyp. 67. – S. 65–73. Henetychna struktura miaso-yaiechnykh kurei za polimorfnymy bilkovymy lokusamy / O.P. Podstrieshnyi, S.V. Ruda, V.V. Bohatyr [ta in.] // Ptakhivnytstvo: mizhvid. temat. nauk. zb. – 2004. – Vyp. 54. – S. 73–79. Katerynych O.A. Borkovskye miaso-yaychnyie kuryi – ptytsa dlia fermerskykh y pryusadebnyikh khoziaistv / O.A. Katerynych, Yu.V. Bondarenko, V.V. Bohatyir // Ptakhivnytstvo: mizhvid. temat. nauk. zb. – 2003. – Vyp. 53. – S. 70–75. Hospodarsko korysni oznaky kurei vitchyznianoho henofondu / V.P.Khvostyk, O.P. Zakharchenko, Yu.S. Liutyi [ta in.] // Ptakhivnytstvo. Mizhvidomchyi naukovyi tematychnyi zbirnyk. – 2013. – № 70. – S. 30–34. FAO, 2011. Molecular genetic characterization of animal genetic resources. Food and Agriculture Organization of the United Nations Publ., Rome, Italy. Merkureva E. K. Henetycheskye osnovyi selektsyy v skotovodstve // M.: Kolos, 1977. – 240 s.
Nei M. Estimation of fixation indices and gene diversities / M. Nei, R.K. Chesser // Ann. Hum. Genet. – 1983. – Vol. 47. – P. 253–259. Shete S. On Estimating the Heterozygosity and Polymorphism Information Content Value / S. Shete, H. Tiwari, R.C. Elston // Theoretical Population Biology. – 2000. – Vol. 57. – P. 265–271. Kuznetsov V.M. F-statystyky raita: otsenka y ynterpretatsyia / V.M. Kuznetsov // Nauchno-teoretycheskyi zhurnal «Problemyi byolohyy produktyvnyikh zhyvotnyikh». – 2014. – №4. – C. 80–104. The article presents the results of research on the influence of seed sowing dates on the yield and quality of the root crops of three varieties of radish (Frantsuzkyj snidanok, Chempion, 18 karat). The possibility of prolongation of the period of receipt of fresh produce by the use of shade netting during late crop sowing was studied. The investigation was conducted in the soil-climatic conditions of Transcarpathia. The seeds were sown in the following terms: 1st sowing – III decade of March, 2nd – I decade of April, 3rd – II decade of April, 4th – III decade of April. It was determined that the duration of phenological phases and general duration of vegetation period were changed for the different periods of sowing. The inter-phase period of “sowing-young growth” was the shortest in all varieties in the 4th seeding period (5–6 days), and the longest – in the 3rd period (10–12 days). The shortest period of formation of root crops was marked for sowing in the III decade of April (7–8 days). The total duration of the growing season was also the shortest (21 to 24 days) for the 4th seeding period using the shaving net. In all varieties the root crops which were harvested from areas with a 1-year sowing date, were the most remarkable. The mass of root crops for the sowing of seeds in the second decade of April, was the least – 0,8–1,2 g. Part of the plants on these variants flowered. The highest quality crop was obtained from the Frantsuzkyj snidanok (10.7 t/ha, marketability 84.5%) and the Chempion (8.3 t/ha, marketability 71.0%) for the first sowing period. High quality yield has been defined due to the use of a shading net for sowing in the third decade of April, despite the fact that its formation took place during a period of high solar insolation and at higher temperatures. Key words: radish, root crops, sowing period, shading net, yield, marketability. Neporozhnaia E. Samyii rannyi ovoshch [Tekst] / E. Neporozhnaia // Ovoshchevodstvo. – 2013. – №2. – S. 30–32. Kutovenko V.B. Hospodarsko-biolohichni osoblyvosti sortymentu redysky v umovakh Kyivskoi oblasti [Tekst] / V.B. Kutovenko, N.M. Merzhii // Ovochivnytstvo i bashtannytstvo. – 2013. – Vyp. 59. – S. 195–198. Hlushchenko C. Ahrovolokno y setky [Tekst] / C. Hlushchenko // Vestnyk ukraynskoho proekta razvytyia plodoovoshchevodstva «Dobra Ahro Novyna». – 2013. – S. 4. Effects of External Coloured Shade Nets on Sweet Peppers Cultivated in Walk-in Plastic Tunnels / A. Ombódi, Z. Pék, P. Szuvandzsiev [et al.] // Not Bot Horti Agrobo. – 2015. – № 43 (2). – R. 398–403. Lolicato S. Sun Protection for Fruit. A practical manual for preventing sunburn on fruit [Text] / S. Lolicato // Published by the Department of Primary Industries, 2011. – 44 r.
Stamps R.H. Use of Colored Shade Netting in Horticulture [Text] / R.H. Stamps // HortScience. – 2009. – Vol. 44 (2). – P. 239–241. Bondarenko H.L. Metodyka doslidnoi spravy v ovochivnytstvi i bashtannytstvi [Tekst] /H.L. Bondarenko, K.I. Yakovenko // Kharkiv: Osnova, 2001. – 369 s.
DSTU 6009:2008. Redyska svizha. Tekhnichni umovy [Elektronnyi resurs] – Rezhym dostupu: http://document.ua/rediska-svizha_-tehnichni-umovi-std3399.html. E.A. Domaratsky, A.V. Dobrovolsky. Influence of non-root infusions with complex multifunctional preparations on the level and qualitative composition of the chlorophyll complex in sunflower plants. The effectiveness of foliar dressing with microelements is widely known. Nowadays, the microfertilizers on complex basis have grown in popularity. It has been proved that plant growth regulators stimulate the growth of the foliar apparatus, affect the biosynthesis of chlorophylls, the formation of chloroplasts, the transport of photoassimilants and the intensity of photosynthesis. The aim of this research was to determine the influence of extra-root dressing with complex multifunctional fertilizer Wuxal® and Helafit Combi® on the state of the initial processes of photosynthesis, to determine the dependence of the responsiveness on light conditions for the formation of chlorophyll content (overall and fractional), depending on the background of mineral nutrition and foliar dressing with multifunctional fertilizers. The article presents the results of studies on the determination of the content of chlorophyll (general and fractional), depending on the background of mineral nutrition and leaf foliage supplementation with multifunctional fertilizers Wuxal® and Helafit Combi®. In the conditions of field experiment on black earths of the usual low humus zone of the Steppe of Ukraine, it has been proved that improvement of the nutritional regime of sunflower agrocenosis (the introduction of mineral fertilizers by the norm N30P45 in combination with the multifunctional combination compound Helafit Kombi®) during the years of research on average increases the total content of chlorophyll by 61%. At the same time, the content of the fraction of chlorophyll “a” increases (by 85% compared with the fraction “b”), and the ratio of the fraction “a” to “b” increases from 2.26 to 4.01. This process is accompanied by an increase in the yield of sunflower by 39%. 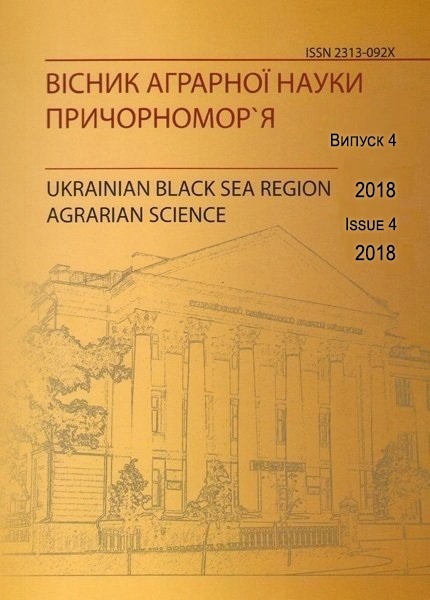 The further use of research results will provide the opportunity for multidimensional study and determination of the degree of influence of new fertilizers and growth stimulators on optimization of the nutritional regime of sunflower agrocenosis and their subsequent use during cultivation of plants in the agroclimatic conditions of the Steppe zone of Ukraine. Key words: sunflower, fertilizer, yield, chlorophyll, Helafit Combi. Speer, Brian R. Photosynthetic Pigments / na saite UCMP Glossary (online). – University of California, Berkeley Museum of Paleontology. Verified availability August 4, 2005. Raven, Peter H.; Evert, Ray F.; Eichhorn, Susan E. Photosynthesis, Light, and Life // Biology of Plants. — 7th. — W.H. Freeman, 2005. — P. 119–127. — ISBN 0-7167-9811-5. Lange, L.; Nobel, P.; Osmond, C.; Ziegler, H. Physiological Plant Ecology I – Responses to the Physical Environment. — Springer-Verlag, 1981. — Vol. 12A. — P. 67, 259. Bulda O. V. y dr. Spektrofotometrycheskyi metod opredelenyia soderzhanyia karotynov, ksantofyllov y khlorofyllov v ekstraktakh semian rastenyi //Fyzyolohyia rastenyi. – 2008. – T. 55. – №. 4. – S. 604-611. Kharakterystyka mitsnosti zviazku khlorofilu z bilkovo-lipidnym kompleksom u roslyn pshenytsi za dii salitsylovoi kysloty ta kadmii khlorydu / Kavulych Ya. ta in. // Naukovyi visnyk Chernivetskoho universytetu. Biolohiia (Biolohichni systemy). – 2013. – №. 5, Vyp. 4. – S. 471-474. Boardman N.K. Comparative photosynthesis of sun and shade plants / N.K. Boardman // Annual review of plant physiology, 1977. – 28(1), 355-377. Karpenko V. P. Intensyvnist protsesiv lipoperoksydatsii ta stan antyoksydantnykh system zakhystu yachmeniu yaroho za dii herbitsydu Hranstar 75 i rehuliatora rostu roslyn Emistym S / Karpenko V. P. // Zbirnyk nauk. prats Umanskoho DAU. – 2009. – Vyp. 72. – Ch. 1. – S. 30- 39. Ponomarenko S. P. Shliakhamy do ekolohichnoi syrovyny dlia vyroshchuvannia produktiv dytiachoho kharchuvannia / Ponomarenko S. P. // Zakhyst roslyn. – 2005. – № 4. –S. 15–17. Vlyianye vnekornevoi podkormky preparatom REAKOM na systemu fotosynteza rastenyi / Bairak N. V. y dr. // Visnyk Kharkivskoho natsionalnoho universytetu imeni V.N. Karazina. Seriia: Biolohiia. – 2008. – №. 8. – S. 137-141. Dospekhov B.A. Metodyka polevoho opyita / B.A. Dospekhov. – M. : Kolos, 1985. – 335s. Teunova E. A. Tekhnolohycheskye yssledovanyia po obosnovanyiu sostava helia khlorofyllypta / E. A. Teunova, Z. D. Khadzhyeva // Razrabotka, yssledovanye y marketynh novoi farmatsevtycheskoi produktsyy : sb. nauch. trudov. — Piatyhorsk, 2010. — Vyip. 65. — S. 232—233. Roslynnytstvo : pidruchnyk / V.V. Bazalii, O.I. Zinchenko, Yu.O. Lavrynenko ta in. – Kherson : Hrin D.S., 2015. – 520 s.: il. Bazalii V.V. Ahrotekhnichnyi sposib prolonhatsii fotosyntetychnoi diialnosti roslyn soniashnyku / V.V. Bazalii, Ye.O. Domaratskyi, A.V. Dobrovolskyi // Visnyk ahrarnoi nauky Prychornomor´ia. – 2016. – № 4 (92). – S. 77 – 84. V. V. Lykhochvor, V. I. Pushchak. The effect of seeding rates and intensification technologies on the productivity of cicer arietinum cultivars. It was discovered that under conditions of sufficient humidity of the western forest-steppe of Ukraine the highest yield has the Yarina variety (2.82–3.40 t/ha), somewhat lower the Pamyat variety (2.60–3.15 t/ha), while the lowest yield was observed in the Triumf vatiety (1.72–2.20 t/ha). The lowest yield of Triumf variety in our research could be explained by its less resistance to infectious diseases under conditions of the western forest-steppe. It was revealed that among the six studied sowing rates, i.e. 0.4, 0.5, 0.6, 0.7, 0.8, and 0.9 mln/ha, the highest yield under conditions of the western forest-steppe was obtained in the range of sowing rates of 0.7–0.8 mln/ha in all cicer arietinumvarieties. The variety Yaryna at such sowing rates demonstrated the yield of 3.31–3.40 t/ha, which is more than the yield of Pamyat variety by 0.21–0.25 t/ha and of Triumf variety by 1.17–1.20 t/ha. Under conditions of sufficient moisture, as it was expected, the lowest yield was obtained at minimal sowing rates. For instance, the yield of Yaryna variety at a sowing rate of 0.8 mln/ha was 3.40 t/ha, while at 0.4 mln/ha it was only 2.82 t/ha, i.e. lower by 0.58 t/ha. The same pattern was observed in case of other varietie as well. It was discovered that the cicer arietinum yield grew up to 2.30 t/ha, or by 1.02 t/ha, when the soil herbicide Reiser KE (2.5 l/ha) was used. When the herbicide was applied, the yield almost doubled, while during appling the Fastak, K.E. (alpha-cypermethrin, 100 g/l) in a concentration of 0.15 l/ha had no effect on the yield. In case of the three-step application scheme of fungicides such as Rex Duo, KS (epoxiconazole, 187 g/l + thiophanate-methyl, 310 g/l) in a concentration of 0.5 l/ha at the early phase of budding, Abacus (pyraclostrobin, 62.5 g/l + epoxiconazole, 62.5 g/l) in a concentration of 1.5 l/ha during flowering, and Folikur 250 EW, WB (tebuconazole, 250 g/l) in a concentration of 1.0 l/ha during seed filling, the yield increased by 0.90 t/ha compared to the variant where fungicides were not applied. In total, due to the use of plant protection products in the experiment, the yield increased from 1.28 t/ha to 3.21 t/ha, i.e. by 1.93 t/ha (150.8 %). Key words: Cicer arietinum, variety, plant protection products, sowing rates, yield. Byolohyzatsyia ahrotekhnolohyy vyirashchyvanyia nuta: rekomendatsyy po effektyvnomu prymenenyiu mykrobnyikh preparatov / [S. V. Dydovych y dr.]. – Symferopol : ChP Eremyna V. H., 2010. – 36 s.
Byorehuliatsyia rosta y razvytyia rastenyi / S. P. Ponomarenko [y dr.] // Byorehuliatsyia mykrobno-rastytelnyikh system / pod red. H. A. Yutynskoi, S. P. Ponomarenko. – K. : Nychlava, 2010. – S. 251–291. Bodnar H. V. Zernobobovyie kulturyi / H. V. Bodnar, H. T. Lavrynenko. – M. : Kolos, 1977. – 254 c.
Bushulian O. V. Intehrovana systema zakhystu nutu vid burianiv, shkidnykiv i khvorob : metod. rekom. / O. V. Bushulian, V. I. Sichkar, O. V. Babaiants. – Odesa : SHI – NTsNS, 2012. – 24 c.
Bushulian O. V. Nut: henetyka, selektsiia, nasinnytstvo, tekhnolohiia vyroshchuvannia / O. V. Bushulian, V. I. Sichkar. – Odesa : 2009. – 248 s.
Hermantseva N. Y. Byolohycheskye osobennosty, selektsyia y semenovodstvo nuta v zasushlyvom Povolzhe : avtoref. dys. na soyskanye nauch. stepeny d-ra s.-kh. nauk : spets. 06.01.05, 06.01.09 «Selektsyia y semenovodstvo» / Rossyiskaia akademyia selskokhoziaistvennyikh nauk ; Hermantseva Nadezhda Yvanovna. – Penza, 2001. – 54 s.
Hermantseva N. Y. Deistvye y posledeistvye herbytsydov na zasorennost posevov y urozhainost nuta v zasushlyvom Zavolzhe / N. Y. Hermantseva // Zernovoe khoziaistvo. − 2005.− № 8. − S. 31−32. Panasov M. N. Adaptyvnaia tekhnolohyia proyzvodstva эlytnыkh semian nuta v zasushlyvom Povolzhe / M. N. Panasov, N. Y. Hermantsev, L. A. Hermantsev // Kormoproyzvodstvo. – 2012. – № 10. – S. 29-31. Sichkar V. I. Perspektyvy selektsii nutu v umovakh Pivnichnoho Lisostepu Ukrainy / V. I. Sichkar, O. V. Bushulian // Visnyk ahrarnoi nauky. – 2000. – № 1. – S. 38–40. Sichkar V. I. Tekhnolohiia vyroshchuvannia nutu v Ukraini / V. I. Sichkar, O. V. Bushulian // Propozytsiia. – 2001. – № 10. – S. 42–43. Sokolov V. M. Stan naukovo-doslidnykh robit iz selektsii zernobobovykh kultur v Ukraini / V. M. Sokolov, V. I. Sichkar // Zbirnyk naukovykh prats SHI – NTsNS. – 2010. – Vyp. 15 (55). – S. 6–13. Stratehiia innovatsiinoho rozvytku selektsii i nasinnytstva zernovykh kultur v Ukraini / Ya. M. Hadzalo, V. V. Kyrychenko, B. V. Dziubetskyi. 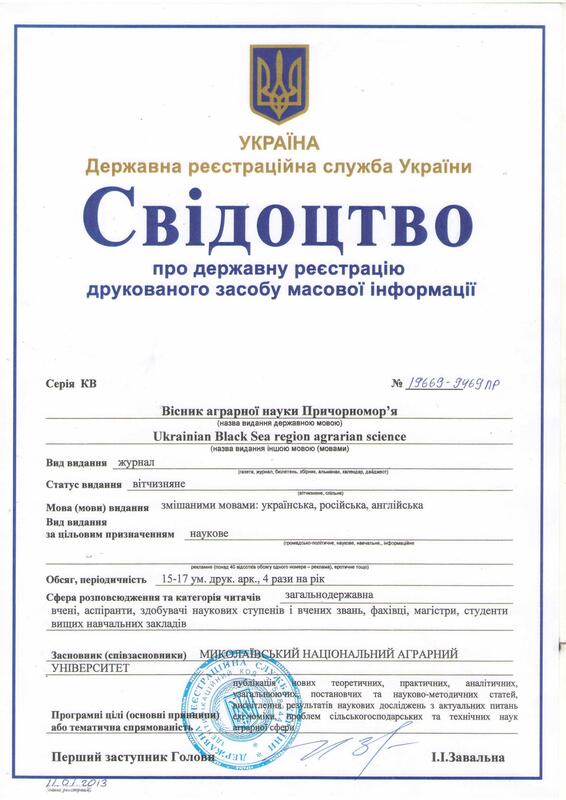 – Kyiv – Kharkiv – Dnipro : [B. v.], 2016. – 32 s.
V.G. Kuryata,O.V.Buinyi,V.V. Rogach. Effect of gibberellin on morphogenesis, formation of photosynthetic apparatus and yield of tomatoes. Synthetic growth regulators are often used in agriculture, due to their ability to influence on morphogenesis and plant productivity. In particular, the effect of drugs of inhibitory action is well studied and described in literary sources, but the effect of growth stimulators, including gibberellins, requires a more detailed study. The obtained results of the study indicate that gibberellic acid had a typical influence on the growth of tomato plants – significantly increased the height, total mass and mass of individual vegetative organs of the plant. Significant changes occurred in the photosynthetic apparatus: the number of leaves per plant increased, as well as the area of surface of individual leaves, which affected the productivity of plants. In addition, the thickness of chlorenchymes increased significantly. The leaf index, which characterizes the ratio of the area of ​​the leaf surface to the plot, significantly increased. At the same time, there was no significant increase in the chlorophyll index and the index of net productivity of photosynthesis. This evidences that the gibberellin action in plants increased the effectiveness of the photosynthetic apparatus precisely by increasing its total area. The concentration of carbohydrates and reserve starch in the ontogenesis of plants decreased in vegetative organs, which may be caused by their outflow to the fruits. In general, in plants treated with gibberellin preparations, due to changes in the photosynthetic apparatus, there was an increase in the concentration of carbohydrates compared with the control. A similar situation was observed with the content of nitrogen. These results may indicate the role of vegetative parts of the plant in the supply of carbohydrates and nitrogen to fruits during the period of carpogenesis. Changes in the photosynthetic apparatus, as well as the redistribution of assimilate streams in plants treated with gibberellin preparations, caused a significant increasing of the crop`s productivity. In particular, there is a significant increasing of yield of experimental plants by 30%. The results of the research indicate the high efficiency of the use of gibberellic drugs in order to control the increasing of the productivity of valuable crops, such as tomatoes. Fotosyntez. T. 2: Assymyliatsyia SO2 y mekhanyzmyi ee rehuliatsyy / D. A. Kyryzyi, A. A. Stasyk, H. A. Priadkyna, T. M. Shadchyna – M.: Lohos, 2014. – 480 s.
Kuriata V. H. Retardanty – modyfikatory hormonalnoho statusu roslyn. – Fiziolohiia roslyn: problemy ta perspektyvy rozvytku: u 2 t., T. 2 / V. H. Kuriata // NAN Ukrainy, In-t fiziolohii roslyn ta henetyky, Ukr. t-vo fiziolohiv roslyn; holov. red. V. V. Morhun. – K.: Lohos, 2009. –– S. 565––589. Poprotska I.V. Zminy v polisakharadnomu kompleksi klitynnykh stinok simiadolei prorostkiv harbuza za riznoi napruzhenosti donorno-aktseptornykh vidnosyn v protsesi prorostannia / I.V. Poprotska. – 2014. – T.46, №3. – S. 190-195. – (Fiziolohiia i biokhimiia kult. roslyn). Yu S. M. Source–Sink Communication: Regulated by Hormone, Nutrient, and Stress Cross-Signaling/ S. M. Yu, S. F. Lo, T. D. Ho // Trends in plant science.-2015. – 20(12). – P. 844–857. Kuriata V. H. Potuzhnist fotosyntetychnoho aparatu ta nasinnieva produktyvnist maku oliinoho za dii retardantu folikuru / V. H. Kuriata, S. V. Polyvanyi // Fyzyolohyia rastenyi y henetyka. – 2015. – 47, № 4. – C. 313–320. Myliuvene L. Effekt soedynenyia 17-DMC na uroven fytohormonov y rost rapsa Brassica napus / L. Myliuvene, L. Novytskene, V. Havelene // Fyzyolohyia rastenyi. – 2003. – 50, № 5. – S. 733-737. Kuriata V. H. Fiziolohichni osnovy zastosuvannia retardantiv na oliinykh kulturakh /V.H. Kuriata, I.V. Poprotska // Fyzyolohyia rastenyi y henetyka. – 2016. – T. 48, № 6. – C. 313–320. Rohach V.V. Diia hiberelinu ta retardantiv na morfohenez, fotosyntetychnyi aparat i produktyvnist kartopli /V.V. Rohach, I.V. Poprotska, V.H. Kuriata // Visnyk Dnipropetrovskoho universytetu. Biolohiia, ekolohiia. – 2016. – T. 24(2). – C. 416-420. Rademacher W. Shemical regulators of gibberellin status and their application in plant production / W. Rademacher // Annual Plant Reviews. – 2016. – vol. 49. – R. 359-403. AOAC. Official Methods of Analysis of Association of Analytical Chemist International 18th ed. Rev. 3.2010 // Asso. of Analytical Chemist. – Gaithersburg, Maryland, USA., – 2010. Baier Ya. Formyrovanye urozhaia osnovnyikh selskokhoziaistvennyikh kultur /Ia. Baier ; [per.s cheshskoho Z.K. Blahoveshchenskoho]. – M.: Kolos, 1984 – S.188-192. 14. Priadkina H.O Deponuvalna zdatnist stebla suchasnykh sortiv ozymoi pshenytsi za zminnykh umov dovkillia yak fiziolohichnyi marker yikh produktyvnosti / H.O. Priadkina, V.P. Zborivska, P.L. Ryzhykova // Visnyk ukrainskoho tovarystva henetykiv i selektsioneriv. – 2016. – T.14, №2. – S.44-50. O. V. Melnik, O. O. Drozd, I. O. Melnyk. Ethylene-activity of apples cv. Reinette Simirenko, treated with ethylene inhibitor depending on the harvest date and cultivating place. Ethylene is a phytohormone responsible for the aging process of plants. The intensity of the ethylene synthesis in climacteric fruits depends on the harvest time and it increases during storage. The optimal harvesting time affects the quality of apples and duration of cold storage. Early collected fruits do not acquire the proper taste, aroma and are prone to the development of skin browning (scald), and late collected ones are less prone to lesions with physiological disorders, but they actively lose the flesh firmness and are not suitable for sale in supermarkets. Post-harvest treatment of the apples with 1-methylcyclopropane (1-MCP) slows the induction of endogenous ethylene and blocks the effects of exogenous one, which reduces the intensity of synthesis and hydrolysis processes in the fruits, restricts the occurrence of physiological disorders and fungal diseases and reduces energy consumption during storage (without reducing the quality of products). The paper studies the influence of the cultivation place, time of harvesting and post-harvest treatment with 1-MCP on the ethylene activity of Reinette Simirenko apples for mass and late harvesting from orchards on the dwarf (M.9) rootstock during storage. Cooled to 5 °C, the fruits were treated with 1-MCP and stored in boxes lined with polyethylene film for up to seven months at a temperature of 2±1 °C and relative humidity of 85–90% (without treatment 1-MCP – control). The intensity of the ethylene emission was periodically measured by the analyzer ICA-56 at a temperature of 18…20 °С. The article establishes the nature of the process of post-harvest ethylene emission by the apples of a late-winter cv. Reinette Simirenko does not depend significantly on the place of collection. The intensity of this process is lower in fruits of mass collection (without treatment of 1-MCP) from the Center of Ukraine. During storage, ethylene activity of apples from the West was lower by 8.0–16.2%. The maximum ethylene activity of untreated apples of late collection (11.9 μl/kg x h) is achieved after 20 days of exposure at 20 °C (regardless of the cultivation place), and after 30 days for the fruit of mass collection, the indicator of the latter from the Center is 1.4 times lower than that from the West. A similar trend is observed during a six-month cold storage with a less dynamic increase in the emission of ethylene from the fruit of mass collection from the Center. Postharvest treatment of 1-MCP dramatically reduces the fruit ethylene activity which, after six months of cold storage does not exceed 0.5 (West) and 0.3 μl/kg x h (Center), and its ethylene activity is 22 times lower compared to untreated fruits. The ethylene activity of recently harvested apples is mainly determined by the time of collection (factor impact is 37.9%), post-harvest treatment with 1-MCP (27.4%) and much less the place of cultivation (2.4%). After two months of cold storage, the ethylene-activity of the fruits is determined by the harvest time (the impact of the factor is 16.8%), treatment of 1-MCP (52.5%), and after four months and to the end of storage – by postharvest treatment with 1-MCP (88.7–96.5%). Keywords: Reinette Simirenko, cultivation place, harvest time, ethylene activity, storage, 1-methylcyclopropene, Smart Fresh. Lelievre J.-M., Latche A., Jones B., Bouzayen M., Pech J.-C. Ethylene and fruit ripening // Physiologia plantarum. 1997. № 101. P. 727–739. DOI: 10.1111/j.1399-3054.1997.tb01057.x. Bulens I., Van de Poel B., Hertog M.L.A.T.M., De Proft M.P., Geeraerd A.H., Nicolai B.M. Influence of harvest time and 1-MCP application on postharvest ripening and ethylene biosynthesis of Jonagold apple // Postharvest Biol. Technol. 2012. Vol. 72. R. 11–19. DOI: 10.1016/j.postharvbio.2012.05.002. Song J., Bangerth F. The effect of harvest date on aroma compound production from Golden Delicious apple fruit and relationship to respiration and ethylene production // Postharvest Biol. Technol. 1996. Vol. 8 (4). R. 259–269. DOI: 10.1016/0925-5214(96)00020-8. Kovac A., Skendrovic B. M., Pavicic N., Voca S., Voca N., Pobricevic N., Jagatic A. M., Sindrak Z. Influence of harvest time and storage duration on Cripps Pink apple cultivar (Malus x domestica Borkh) quality parameters // CyTA – Journal of Food. 2010. Vol. 8. № 1. P. 1–6. DOI: 10.1080/11358120902989632. Cliff M. A., Toivonen M. A. P. Sensory and quality characteristics of Ambrosia apples in relation to harvest maturity for fruit stored up to eight months // Postharvest Biol. Technol. 2017. Vol. 132. R. 145–153. DOI: 10.1016/j.postharvbio. 2017.05.015. Vielma M., Matta F., Silva J. Optimal harvest time of various apple cultivars grown in Northern Mississippi // Jour. Amer. Pom. Soc. 2008. № 62. P. 13–21. Melnyk O., Drozd O., Boicheva N., Zhmudenko Yu.,Melnyk I., Khudik L., Remeniuk L., Vykhvatniuk L. Ethylene emission of apples treated with 1-methylcyclopropene during storage // Jour. Hort. Res. 2014. Vol. 22. № 1. R. 109–112. DOI: 10.2478/johr-2014-0013. Jung S.-K., Watkins C. B. Internal ethylene concentration in apple fruit at harvest affect persistence of inhibition of ethylene production after 1-methylcyclopropene treatment // Postharvest Biol. Technol. 2014. Vol. 96. P. 1–6. DOI: 10.1016/j.postharvbio.2014.04.008. McCormick R., Neuwald D. A., Streif J. Commercial apple CA storage temperature regims with 1-MCP (SmartFresh): Benefits and risks // Acta Hort. 2012. № 934. R. 263–270. DOI: 10.17660/ActaHortic.2012.934.32. Dzheneev S. Yu., Yvanchenko V. Y., Dzheneeva E. L. Metodycheskye rekomendatsyy po khranenyiu plodov, ovoshchei y vynohrada (orhanyzatsyia y provedenye yssledovanyi). Yalta: Yn-t vynohrada y vyna «Maharach», 1998. 152 c.
Melnyk O. V. Zbyralna styhlist yabluk: metod indukovanoho etylenu. // Novyny sadivnytstva. 2010. № 3. S. 36–37.